For information about the Battery Tender Jr., check out this Battery Tender Junior review. Every scooter owner should have a motorcycle battery tender for winterizing. It's a sad fact that no matter how much we want to keep riding into the coldest part of the year, most of us will not be able to. I live in the mountain west, in Idaho, and it gets darn cold here from November through early March. Too cold for me to ride, actually. And then there's the rain, ice, and snow we get for 3 to 5 months on end. Bottom line is, most of us need to garage our scooters for at least a few weeks, if not a few months, every single winter. We put our scoots away and we don't ride them until the warm breezes bring blooming flowers in early (or maybe late) spring. And hopefully, you winterize your scooter before you put it into mothballs. What you need is a motorcycle battery tender, or what is called a 12 volt battery tender. A battery tender supplies your battery with small amounts, or trickles, of charge on a pretty much continual basis, so it never fully discharges and goes dead. There are many different brands and models available, but one of the most popular – and best buys – is the Battery Tender Jr. , which I am reviewing on this page. When it comes to a battery tender, it's important to understand the various features and benefits that are important. Power - 6 volt, 12 volt, etc. So, what IS a battery tender exactly? It's a plastic encased electronic box, about 8 inches x 4 inches x 9 inches, that is attached to a 12 foot electric output cord. It has a microprocessor controlled fully automatic charger and maintainer and is designed to extend the life of any lead acid battery commonly used in automobiles, motorcycles, ATVs, personal watercraft, RVs, boats, airplanes, golf carts, back-up generator systems, etc. The charger is 12v/75 amps and can charge any lead-acid battery, including standard and sealed AGM and GEL Cell battery types. Battery tenders are designed to be used in small spaces to keep batteries safely charged – but not overcharged – when not in use. How Does the Battery Tender Junior Measure Up? Let's go back and look at all of the items I found through my research were important in a motorcycle battery tender and see how the Battery Tender Jr. measures up. 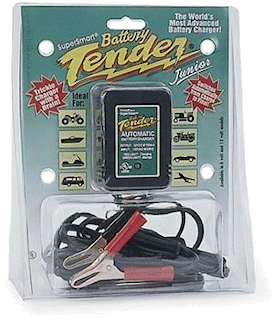 The Battery Tender Jr I am reviewing here is a 12-volt model. 6-volt models are available; however the 12-volt size is what is recommended for scooter (or motorcycle) battery tenders, so this is perfect for our needs, in terms of this feature. Another important feature is safety, since you're dealing with an electrical charge. Things to look for include that it is spark-proof when you make/maintain the connections (don't want your scooter starting a fire! ), that it won't short circuit and also that it protects against reverse polarization. The Battery Tender Jr. has all of these features. When you use a battery tender, you want to be sure that it will keep your battery charged... without overcharging it and causing damage. With the old-fashioned trickle charger my husband uses on our batteries, we have to manually monitor when it has finished charging the battery and then unplug it. With a quality battery tender, you never have to do that. It tends to, or monitors, your battery charge on its own and makes adjustments as necessary. The Battery Tender Junior has a 4-step charging program that allows you to connect the charger to your scooter battery, either in the scooter or out of it. And then you can forget about it until you are ready to put the battery to work. The 4 steps are: initialization, bulk charge, absorption mode and float mode. 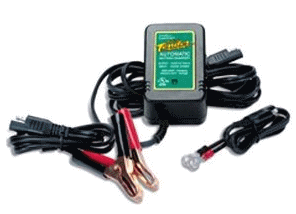 At the end of the regular charger cycle, this motorcycle battery tender automatically switches its output voltage to a safe, storage or float level that eliminates any need to worry about the damaging effects of overcharging. If/when the battery voltage drops too far under load, output power resumes and the charging cycle begins again. In my opinion, the Battery Tender Jr. truly sounds as though it is "set and forget"! Let's face it... If a device like a tender is not easy to use, most of us won't use it as regularly as we should. Nobody likes a hassle, right? Luckily, the Battery Tender Junior is simple to set up and use. It's lightweight, compact, fully automatic and very easy to use, especially in small spaces. As described above, its advanced technology means it does the work, not you. No worries, no checking. Just hook it up and your work is done. If you do want to know the status of the charger, its solid state, easy to understand two color LED indicates stage of charger. In addition, it comes equipped with alligator clips and ring terminals that are easy to hook up to your scooter battery. Apparently, temperature compensation can be important in hotter climates. Some sites I read indicated it was important, but I also found conflicting information. This might be the only place where the Battery Tender Jr doesn't excel. According to a couple of the reviews on Amazon, Battery Tender's support supplied this answer: "The Junior is not a temperature compensating unit, however, when the temperature is hotter, the unit will actually charge the battery a bit faster and it will not harm the battery." I'm not positive at this point that temperature compensation is a huge issue, but if you decide it's important in your buying decision, then you could go for the upgrade model, the Battery Tender Plus. How Much Should You Expect to Pay for a Battery Tender Jr? The Battery Tender Junior retails for $39.95, but you can get it a lot cheaper at various online websites. The best price I found was at Amazon.com , though, and that was echoed in the customer reviews. Amazon is selling it for $23.38 at this writing, a savings of over $16 off retail. Amazon has discounted the Battery Tender Jr. as one of their "Hot Deals". I have no idea how long it will last, but right now you can get this product for a mere $20, and if you have Amazon Prime (which is a great deal if you order very often from Amazon), you'll get free 2-day shipping! I just ordered mine and look forward to installing it on Monday! I've always found Amazon to be a great place on the Web to shop, with reliable customer service, order processing and a consistently positive buying experience. Yes, the Battery Tender Junior comes with a 5-year warranty to the original purchaser based on defective material or workmanship. Warranty is void in cases of product misuse, disassembly or modification. If you've gotten this far, then you've read a lot of what I think about the quality of the Battery Tender Jr. But you might also be interested to hear what other people are saying. As I researched motorcycle battery tenders on the Web, I found that this brand/model name cropped up on almost every site. It appears to be the tender of choice for scooter owners throughout the U.S. But what I really found amazing is that there are more than 350 reviews of this product on Amazon, and 300 of the reviewers gave it a 5-star rating (out of 5 stars)! Another 39 gave it 4 stars. That's nearly 97% of the total reviews that are very positive. Sounds like a winner to me! "By popular acclaim and editorial content, the Junior and the Plus have garnered untarnished reputations and withstood the test of time. For maintaining your battery, there really isn't anything else out there." "This got the job done. Double thumbs up." "Pretty cheap price to pay for having a battery always topped up & ready to go." "I bought this battery tender for my 2009 Genuine Buddy 125cc scooter after a three month work trip left my battery completely drained. The positive and negative clamps are well labeled and there's a light that lets you know when your battery is mostly charged. The battery tender got my scooter battery up to 100% within about 10 hours." "I ride my motorcycle in Michigan, where it gets put into storage for several months each winter. With the Battery Tender Junior I completed a one time install of the quick disconnect cables on my bike to the battery posts and now when I'm putting the bike up for a while I just plug it in and walk away. Whenever I come back to ride again the battery is always fully charged and ready to go. I spend no time any more removing or installing the battery. Certainly worth the money as I'm sure it is extending the life of my battery as it's kept active all year round." There were a few negative reviews on Amazon, but in reading them, I found that most were either complaints about shipping (not the product) or showed the reviewer didn't really understand how a batter tender is supposed to work. I think you have to let the numbers do the talking here... a 97% approval rating is pretty darn impressive! All in all, I see no reason not to recommend the Battery Tender Jr. It's widely used by scooter owners, is very affordable and it gets the job done... easily. It's a great choice for anyone wanting to winterize their scooter. I really don't think you'll find a better value in a motorcycle battery tender than the Battery Tender Junior. 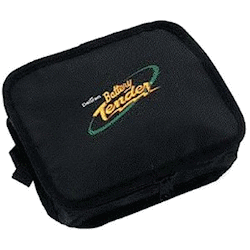 Where Can You Buy the Battery Tender Jr? You can buy this product directly from the BatteryTender.com website, though they'll charge you the full retail price. But you can find it discounted at a variety of places on the Web. I'm guessing you could probably buy it at your local scooter shop, motorcycle store or auto parts store too. But here's why I recommend you buy through Amazon . It'll probably save you money by buying direct. You probably won't have to pay sales tax, unless you live in New York State. And shipping is almost always free on items that cost more than $25 on Amazon, so if you buy another small item, say the utility pouch or the 25-foot extension cable, it'll easy take it up into that range. And you won't need to use any gas to get it! Order it, and you should be able to have it in your hands in less than a week. So Amazon is definitely my pick! Click here to see the Battery Tender Jr.
Where Can You Read More Reviews for the Battery Tender Jr? In my opinion, the best place on the Web to read legitimate product reviews is Amazon. Click here to read them.